2K to 10K Betting challenge continues on Saturday from Lingfield . The Betting Bankroll stands at £2358 (+£358) after Donjuan Triumphant won the Wentworth Stakes at 4-1 for £206.00 profit.Nice to finish the turf season with winner. 9 Runners declared for 10f Churchill Listed Stakes on the poly track .This looks interesting listed contest ,with the three main contenders .Addeybb, Master The World & Scarlet Dragon . ADDEYBB : 4-Y-0 Chesnut Gelding ,winning 5 out 9 .Shown some useful form on turf this season ,including winning the G2 Bet365 Mile at Sandown in April,though has been disappointing in G1 company on his last two starts .Takes big drop in class on his All Weather Debut ,though has to defy 7lb G2 penalty . 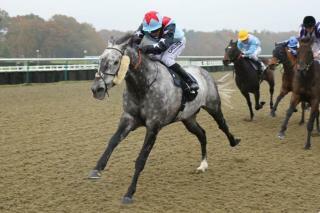 MASTER THE WORLD : 7-Y-0 Grey Gelding ,winning 2 out 7 on All Weather.Had some excellent form here at Lingfield last season,including winning this race last year .Also won the Winter Derby and finished second in Easter Classic over C&D at Lingfield .Shown very little on turf this season ,though will be suited returning to Lingfield on poly track . SCARLET DRAGON : 5-Y-0 Bay Gelding,winning 5 out 25 on turf .Not won since October 2016,though has shown some creditable placed form ,including finishing close second in G3 September Stakes on All Weather last season ,also finished fair third in St Simon Stakes at Newbury in October .Should be thereabouts,though drop in trip may not be ideal . VERDICT : The 117 rated Addeybb is clearly the one to beat on his group two winning form earlier in the season,though faces no easy task under 7lb (G2) penalty .Also has question mark ,having been well beaten on his last two starts.The big drop in class will help ,though odds around 7-4 look poor value on his All Weather debut, over this longer trip . Last years winner MASTER THE WORLD will need bounce back to form,after some disappointing efforts on turf this season ,though goes particarly well here on poly track at Lingfield ,including winning Winter Derby and finishing close second in Easter Classic earlier this year .Odds around 6-1 look fair each-way value . Thanks for comment ,Yes I try to narrow down the race to my three main fancies for race .Then try to find value bet out the three . Nice work, Jerry. Another winner and decent price, too. Thanks Jason ,Yeah always seem go well at Lingfield.I thought 6-1 was decent value ,surprising it drifted to 8-1 on Betfair.Though can't complain about 6-1 wiinner!! Well done Jerry.Two in a row. Cheers mate.Hopefully be profitable season on All Weather. Like the new theme. Looks clean-cut and very good. Cheers Jason,yeah I'm thinking changing the design .I think it looks bit better than before.